Suited for both studio and field situations, the StudioVision 28" 4K HDMI Monitor goes wherever you need versatile, multi-input video monitoring. This 28" native UHD 4K monitor comes housed in a hard case with a removable front cover and rear door access. Its 3840 x 2160, 10-bit panel supports up to UHD 4K30 via each of three HDMI 1.4 inputs, or up to UHD 4K60 via its single HDMI 2.0 input. Additional inputs for HD and VESA sources include 3G-SDI (with loop-through), DVI, and VGA. Video signals input via any of these ports will be properly scaled to fit the entire screen. A multiview feature enables you to choose between single, dual top/bottom, dual left/right, and quad input displays. Listed to analog audio from the RCA inputs or embedded digital audio from video inputs using the monitor's built-in speakers or the 3.5mm headphone output. 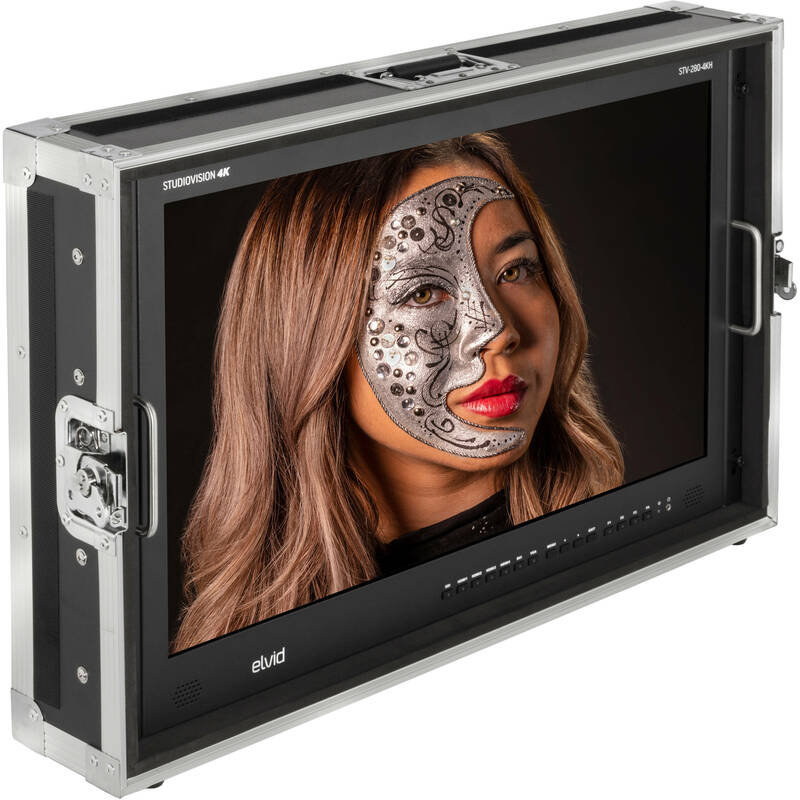 Power the StudioVision 28" in the field using V-mount batteries and the integrated battery plate, or in the studio via the 4-pin XLR port and the AC power supply. The 75/100mm VESA patterns and support feet provide alternative mounting options for the monitor. The included tally connector passes tally information through to the monitor when connected to a switcher. A case-mounted sunshade with hook-and-loop fasteners is included for optimal viewing on exterior locations.